Wild Child is all about learning the art of being in nature. We work to help the children deepen the understanding of the world they sense, and build up the knowledge of connection a little bit at a time. 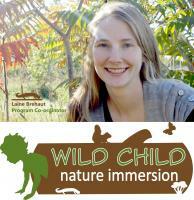 One of the most important components of the Wild Child program is getting children out into natural areas. Having children experience a new space is one of the easiest ways to get them engaged and excited. All of the games and activities are designed to get them to use their senses more fully, inhabit their bodies, use their imaginations, and ask questions. Every child is a natural explorer in their own way, and they all have unique strengths and insights that they're eager to share. We work to give them every opportunity to get excited about the world around them and to learn to follow their own interests as much as possible. Nature is a rich and generous playground, and our ultimate goal is to have the children take the helm and immerse themselves in play. “Play is often talked about as if it were a relief from serious learning. But for children play is serious learning. Play is really the work of childhood.” - Fred Rogers. What are we really missing if we don't get outside? What does an infant miss if it doesn't have someone to care for it and teach it? What does an animal miss if it spends it's time in a cage? What do people miss if they don't get to know wild spaces? We are sensate creatures. We absorb the world around us in a multitude of simultaneous ways. Our ability to make sense of what we see and hear and to understand the deeper meaning of what goes on around us is a lifelong learning process. We get better at things we practice, and sometimes we forget what we once knew. We're less like stones with words etched into them and more like sandcastles that are subject to the tides of time. What we surround ourselves with matters. The quality and type of sounds, sights, and processes that we're exposed to matters. How often we're surrounded by beauty and full of wonder matters. Humans are really good at creating beautiful, clever, functional things, but we just aren't capable of making anything to rival what nature has spent billions of years creating. We make warm, snug houses, but where are the breezes that tell us that rain is on the way? We make soft carpets, but they aren't alive beneath our bare feet. We make bright lights, but they block out the stars at night. One way our creations differ from nature is that nature never ignores the context of life; everything is connected, everything has purpose, everything has history and is innately rich and complex. If we spend all of our time in man-made spaces we're depriving ourselves of the wholesale engagement of our senses. We lose sight of our connections to—and our sense of place in—the world. This affects all people, but especially the little ones who are developing so quickly. A day without the outdoors would be like a week to a grown up. We're wired to learn from nature and it's lessons encompass everything. The good news is that the cure to disconnection is really simple: Get outside. Everyday. And into the most diverse and rich landscape you can find. Nature is an amazing teacher! The more time we spend outside the better we get at appreciating and learning from it. Taking children outside and having them open up to the natural world is like reintroducing them to a long lost friend and often, a lifelong mentor. Teaching kids to experience the wonder of nature is like teaching a duck to float or a raindrop to fall. All they really need is opportunity! Red Squirrel: Energy & Enthusiasm! The animals help represent different ways of experiencing the joys of nature and remind us that each child's way is valid and important. Every child and group, and every day is a different combination of these elements. Your child probably excels at a few of these naturally. We have lareger themes we explore together, but we suit the lessons to the type of activity that inspires the children the most that day. If they want to run, we run, if they want to listen, I speak, if they want to share—and they almost always do—then we listen. The goal being that they feel empowered and interested and excited in the outdoors. Try it. I promise you will never regret it. From sunny days to raging snowstorms to calm, still, black nights. This activity is always worth doing. We rush a lot. Sometimes we might feel that if we're out in nature, we have to be doing something, or going somewhere. We miss so much when we're moving. Stop and let the world move around you for awhile. Let nature come to you. Explore the little worlds within your arm's reach and help your children find them too. Sometimes the smallest things are the most important and finding joy is as simple as stopping to look for it.